An elusive travel destination for Americans, Cuba is often called the “Pearl of Antilles”, it’s a Marxist–Leninist one-party republic that was ruled by Fidel Castro until 2008 when he announced his resignation. An island country located between the Caribbean Sea and the North Atlantic Ocean, and just 150 kilometers south of the Key West, Cuba is home to more than 11 million people. We at allé are in love with Cuba because it’s like a history capsule; untouched, raw and beautiful. We’re convinced you need to get there immediately, before everyone else discovers it and it becomes the next Cancun, riddled with dime-a-dozen resorts. To make travel planning to Cuba easier for the independent traveler, we’ve put together this guide on How to travel to Cuba. Before Fidel Castro took over Cuba in 1959, Cuba was known for its shopping districts, luxurious hotels and casinos, well-paved streets, a thriving economy, and was a vacation hot-spot for celebrities and socialites from all over the world. In 1960, the United States broke off diplomatic relations with the country and imposed a trade embargo due to the reforms foisted by Fidel Castro. This is one of the reasons why Cuba has that ‘time warped’ feel. Progress in the country since then has been slow, evidenced by its streets packed with vintage cars, remnants of the 1950s, such as Oldsmobiles, Studebakers, Pontiacs, and Chevrolets, and old crumbling buildings that are a common sight. Before the collapse of the Soviet Union, the tourism industry mainly relied on tourists from communist countries. By the 1990s, Cuba slowly opened its doors to Canadians and Europeans, of which, Canadian tourists are the most frequent visitors of the country. In 2016, President Obama became the first U.S. president to visit the island in nearly 90 years. He and Raul Castro (Fidel Castro’s brother) discussed the removal of the U.S. trade embargo which will also allow US citizens to travel to Cuba but with certain restrictions and limitations. US citizens can now travel to Cuba under 12 categories that are listed as authorized travels. Although traveling to Cuba is easier now, planning a trip to the country can be very complicated logistically. By September this year, American Airlines will start frying to Cuba regularly, making it one step easier to plan your trip. There was a time that only educational, religious, and cultural groups could legally travel to Cuba, but the ban on travel to Cuba has been amended and you may visit Cuba under the 12 categories listed for authorized travels. You may apply for a visa under these categories by yourself but it will be difficult as you need to document your activities. However, going with an organized tour with a tour company that specializes in traveling to Cuba will make it easier as they do all the applications and arrangements for you. Do note though, that these tours are often quite overpriced, so if you like you can also work with a travel planner or travel agent to simplify the process of applying for your visa and arranging your flights and then you can have a more independent itinerary without having to stick with a group the whole time. Another option, although it is considered “illegal”, is to fly to Cuba through a foreign gateway country such as Canada, Mexico, or the Bahamas. This means you fly to any of these countries by purchasing a round trip ticket, and purchase another round trip ticket from that country to Cuba. At the airport, you can buy a 30 day Cuban tourist visa for USD$20 to USD$30. This is not attached to your passport and when you get to Cuba, the immigration officer will stamp your card instead of your passport. 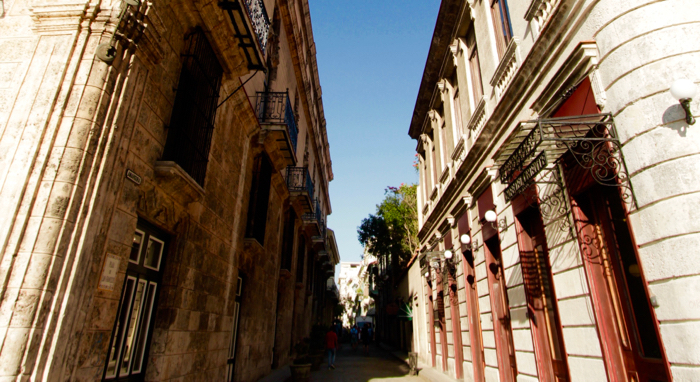 As of 2015, the Cuban exit fee is now bundled up with airfare. Travel Medical insurance is required for visitors to Cuba. If you have not purchased one before your departure, you may buy a policy from a Cuban insurance company at the airport. You may purchase medical travel insurance to Cuba from any of the following authorized agencies listed or buy one at the airport. Plan on filling your pockets with cash when traveling to Cuba. Credit and debit cards issued by American banks or linked to U.S. financial institutions will not work in the country. If you are able to acquire Canadian dollars before you trip, you might want to bring more Canadian dollars as the exchange rate is more reasonable. There is a special 10% penalty fee when exchanging your US dollars to CUC (Cuban Convertible Peso). International Hotel Chains can be found in the country’s major beach resorts, tourist places and in Havana. The following chains have hotels in Cuba: Accor, Be Live, Royalton, Riu, Eurostar, H10, Hoteles C, Hotetur, Sandals, Barcelo, NH, Occidental, Blau, Iberostar, and Sol Melia. Cuban Hotel Chains including Islazul which operates the budget hotels, Cubanacán which runs the midsize options, Gaviota and Gran Caribe which are more upscale, and the Habaguanex which is known for having the most attractive hotels. Hostales which are also state-owned and run by Cubanacán and Habaguanex. These are actually boutique hotels mostly found in Cuba’s provincial cities. National-Peso Hotels which are intended for the locals and are not recommended for tourists. Because these hotels do not have the usual facilities and are set in dilapidated buildings, tourists are not usually entertained. Casa Particulares is the best option if you are in a budget and want gain more insight about the country and the locals. They are found throughout the country and can be compared to a bed and breakfasts accommodation in the western world. These casas can be identified by a blue insignia (usually displayed near the front door). The orange insignia is an indication that the casa is for Cubans only. Most of these casas are of better conditions and are far superior compared to cheaper hotels. Campismos are actually quasi-campsites usually located near a river or small stretch of beach in the countryside. It is an excellent accommodation option if you want to enjoy the countryside. They offer basic accommodation in simple concrete cabins. However, the locals are given priority over tourists, and are often block-booked in June and July for the workers’ annual holidays. Airbnb accommodations in Cuba are relatively new. It was just authorized by the U.S. treasury department in early 2015. Because internet connection is slow and cannot be accessed by majority of the population, as well as credit cards are not accepted, Airbnb bookings are done with the licensed industry that book private homes that rent out rooms to travelers. Renting a car is relatively easy in the country. There are two state owned firms that provide car rental services, Cubacar and Havanautos. There are a few private car rental options, and the most popular one is the CarRental Cuba. Word of warning though, driving around Cuba can be a little rough due to the poor conditions on many secondary roads, lack of adequate street signage, and poorly lit roads, but traffic is relatively nil especially in the countryside. You may also check out Rex Car which offers chauffeur services. There are different types of taxis in Cuba, namely: the tourist taxi which are the official metered state taxis that charge in CUC; privately owned taxis which do not have meters, licensed to charge either in national pesos or CUC, and rates can be haggled; communal taxis which means you share the ride with other people, and runs along specific routes; bicitaxis which are three-wheeled bicycles suited for two passengers; and the cocotaxis which caters to tourists who want to experience a ride in town on a semi-encased giant yellow bowling ball pulled by a small scooter. You can travel around Cuba by train but be ready for delays and cancellations. Although there are a few trains that provide first class accommodations, there are no sleeper cars. You might have to watch over your luggage as they are frequently stolen in trains. If you are not in a hurry and want to interact with the locals, traveling on a train might be a good option. Traveling by bus is one option if you want to visit the countryside. There are two bus companies that are often used by tourists. The Viazul buses are modern, air-conditioned, and equipped with video and toilet, and Astro buses, the regular national public transportation which are less reliable and comfortable. Astro buses have few spots available exclusively for tourists. If you do decide to take the public bus, be warned that it can be quite crowded and you must keep your valuables well concealed. Hotels: US$25 minimum to about $180 per room per night. Casa Particulares: US$20 to US$30 per night for a double room. Casa Particulares accommodation US$140, food (average meal) US$168, bottled water (8 bottles per day) US$40 = US$348 per week. This does not include transportation fares, entrance fees, drinks, outdoor activities, snacks, and personal necessities. The best time to go is from November to April, the dry season in Cuba. You can expect dry, clear skies, and sunny days. This is also the peak season in Cuba for travelers. The winter months of January and February brings about cooler weather. The months from May through October are considered the wet season, and the annual hurricane season is from June to November. Despite being wet season months, July and August are considered peak season due to the number of festivals that are celebrated throughout Cuba. What about bringing back Cuban cigars? According to U.S. Customs and Border Protection, you may purchase alcohol and tobacco products while in Cuba for personal consumption, and authorized travelers may return to the United States with up to $100 worth of alcohol or tobacco or a combination of both.